The IMTS (Inter­na­tion­al Machine Tool Show), the largest and most impor­tant met­al­work­ing event in North Amer­i­ca, took place in mid-Sep­tem­ber in Chica­go. The US machine tool asso­ci­a­tion AMT, the organ­is­er of the event, cap­tured the suc­cess with head­lines such as “Boom­ing man­u­fac­tur­ing econ­o­my” and “Vis­i­tors have cap­i­tal and are ready to invest!” A broad range of user groups in the USA indeed focus their pro­cure­ment activ­i­ties on the event. Increased demand for uni­ver­sal tech­nol­o­gy in the US is expect­ed in the Q3 order fig­ures. Invest­ments in spe­cial equip­ment and projects are expect­ed to be reflect­ed in the Q4 results. The eco­nom­ic envi­ron­ment and US eco­nom­ic pol­i­cy have con­tributed to the suc­cess of the IMTS. The Trump tax reforms have freed up the nec­es­sary cap­i­tal resources. The machine tool mar­ket is cur­rent­ly being dri­ven by trends towards dig­i­tal­i­sa­tion, increased automa­tion and addi­tive process­es. In addi­tion, Boe­ing has a com­pet­i­tive advan­tage over its Euro­pean com­peti­tor Air­bus at present, which is boost­ing demand from the air­craft indus­try, espe­cial­ly the engine-build­ing sec­tor. The dis­cus­sion about stricter emis­sion val­ues and the pos­si­bil­i­ty of a rapid switch to elec­tric vehi­cles are much less unset­tling for US car buy­ers than for con­sumers else­where. Major auto­mo­tive orders placed in 2016 and 2017 have now been ful­filled. A struc­tural­ly more bal­anced demand struc­ture is there­fore expect­ed for 2018, which will be less dom­i­nat­ed by the auto­mo­tive sec­tor. Nev­er­the­less, in sharp con­trast to the con­se­quences of the diesel scan­dal in Europe and Ger­many, Gen­er­al Motors is plan­ning to launch an eight-cylin­der diesel mod­el. Ford also plans to launch diesel mod­els dri­ven by engines equipped with more than sev­en cylin­ders, which will put a lot of pow­er onto the road. The con­clu­sion for the auto­mo­tive indus­try in the USA is there­fore that although moves towards elec­tri­fi­ca­tion are fore­see­able for lighter com­mer­cial vehi­cles, the effects in the pas­sen­ger car sec­tor will only be felt in the medi­um term at the ear­li­est. And these, too, will then reflect America’s spe­cif­ic mobil­i­ty require­ments, with its asso­ci­at­ed vehi­cle sizes and engines. Orders received from US machine tool man­u­fac­tur­ers and spe­cial­ist deal­ers rose sharply by 22 per cent dur­ing the first sev­en months of 2018. AMT describes the cur­rent devel­op­ment as “…out­stand­ing in the face of mar­ket uncer­tain­ty due to trade ten­sions.” The Ger­man machine tool indus­try, too, is ben­e­fit­ing from this devel­op­ment. In the cur­rent Glob­al Machine Tool Out­look from VDW and Oxford Eco­nom­ics, which is about to be pub­lished, US machine tool con­sump­tion for 2018 is up more than 13 per cent on a dol­lar basis, hav­ing already grown by 8 per cent in the pre­vi­ous year. In 2019 it is expect­ed to increase by a fur­ther 5 per cent. The pro­duc­tion val­ue in our sector’s most impor­tant US user indus­tries will there­fore rise by over 4 per cent in 2018 and just under 3 per cent in 2019 – a dis­pro­por­tion­ate­ly low rate com­pared to the mar­ket vol­ume for machine tools. By com­par­i­son: for Mex­i­co, a very mod­er­ate increase in con­sump­tion of less than 1 per cent (cal­cu­lat­ed in Pesos) is expect­ed for the cur­rent year. In 2019, the growth is expect­ed to stall even more stark­ly. Cana­di­an machine tool con­sump­tion is expect­ed to rise by 8 per cent in 2018, but only by just over 1 per cent a year lat­er, accord­ing to fore­casts. The IMTS final report pro­claims 132,316 square metres of net exhi­bi­tion space, an increase of 4 per cent over the pre­vi­ous event. As in 2016, the four co-locat­ed shows of Deutsche Messe AG were ful­ly inte­grat­ed into the IMTS port­fo­lio. The event was sup­port­ed by exhibitors drawn from at least 450 companies/brands in the fields of automa­tion and dri­ve tech­nol­o­gy, sur­face tech­nol­o­gy, com­pres­sion and vac­u­um tech­nol­o­gy, as well as indus­tri­al sup­plies, all look­ing for fur­ther sys­tem com­po­nents. The pre­vi­ous record, set in 2000, was 131,537 square metres. There was a total of 2,563 exhibit­ing com­pa­nies, an increase of 7 per cent com­pared to 2016. The num­ber of vis­i­tors, at 129,415, was 12 per cent high­er than in 2016 and also sig­nif­i­cant­ly exceed­ed the pre­vi­ous record of 121,764 vis­i­tors in 1998. At that time, the dot­com hype was at its height. Irre­spec­tive of the pure vis­i­tor num­bers, there were reports of many more deals being nego­ti­at­ed than at the pre­vi­ous event, as revealed in con­ver­sa­tions with indi­vid­ual VDW mem­bers. Pro­ject­ed on the basis of 2016, 113,600 vis­i­tors were record­ed in the cur­rent year via elec­tron­ic “pre-reg­is­tra­tion”. Ulti­mate­ly, no one can say how many of these were actu­al­ly present. In addi­tion, the AMT had invit­ed around 20,000 (!) stu­dents and pupils to the event: no infor­ma­tion was pro­vid­ed about their atten­dance. The impres­sion once again was that there were extra­or­di­nar­i­ly high vis­i­tor num­bers in the first three days of the fair, which tailed off rapid­ly on Thurs­day and Fri­day, mak­ing Sat­ur­day seem rather super­flu­ous. The West and East Halls enjoyed rel­a­tive­ly strong atten­dance lev­els over­all, how­ev­er they remained behind those of the North and South halls, as they did at the pre­vi­ous event. Addi­tive man­u­fac­tur­ing, hybrid pro­cess­ing, robot­ics and increased automa­tion with a focus on new sen­sors and proces­sors and dig­i­tal­i­sa­tion: these char­ac­terised the range of the exhi­bi­tion and were the main top­ics being dis­cussed. The VDW used IMTS 2018 as a plat­form for pre­sent­ing its con­nec­tiv­i­ty activ­i­ties as pre­req­ui­sites for Indus­try 4.0 to an inter­na­tion­al audi­ence. Supe­ri­or mul­ti-spin­dle machines with up to eight axles were among the high­lights show­cased by the Ger­man exhibitors. These can halve med­ical engi­neer­ing cycle times, for exam­ple. Gen­uine 5-axis milling machin­ing in com­bi­na­tion with high­ly flex­i­ble han­dling sys­tems were among the machin­ing cen­tres on show, some robot-assist­ed and with large machin­ing areas. Also fea­tured were “heavy cuts” in chal­leng­ing mate­ri­als with no loss of accu­ra­cy, 5 and 6-axis machin­ing for high-pre­ci­sion grind­ing, milling and drilling func­tions in a sin­gle clamp­ing, part recog­ni­tion tech­nolo­gies for pre­ci­sion man­u­fac­tur­ing in gear con­struc­tion and, of course, sys­tems for addi­tive man­u­fac­tur­ing. 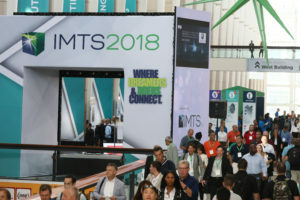 The next IMTS will take place from 14 to 19 Sep­tem­ber 2020 at the usu­al venue – McCormick Place in Chica­go.